Our weather forecast is calling for scattered snow showers Sunday and Monday. I’m hoping the weather guessers are operating at their usual efficiency because I usually don’t notice these guys until after I’ve mowed the lawn and they flock in to hunt for insects. Here’s to signs of good things to come! I got some nice shots of a pair of Mourning Doves, as well. Those will be on my Virginia Through My Lens page as soon as I can get them posted. This entry was posted on March 3, 2012 by Roket Man. 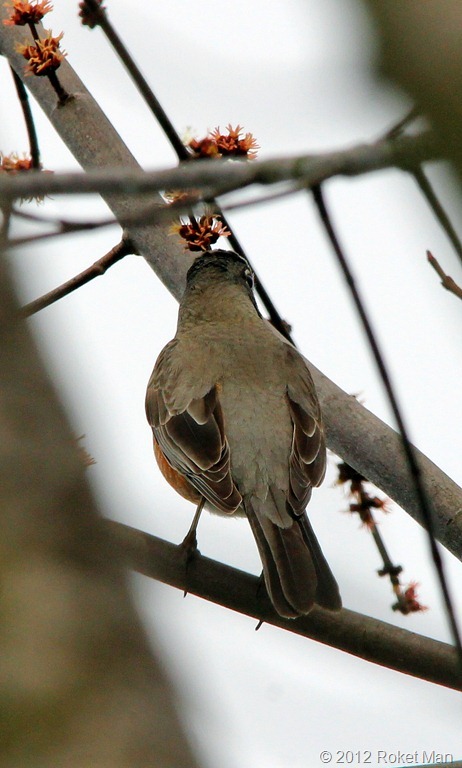 It was filed under Birds, Blue Ridge Mountains, Mother Nature, New River Valley, Photography, SPRING! . 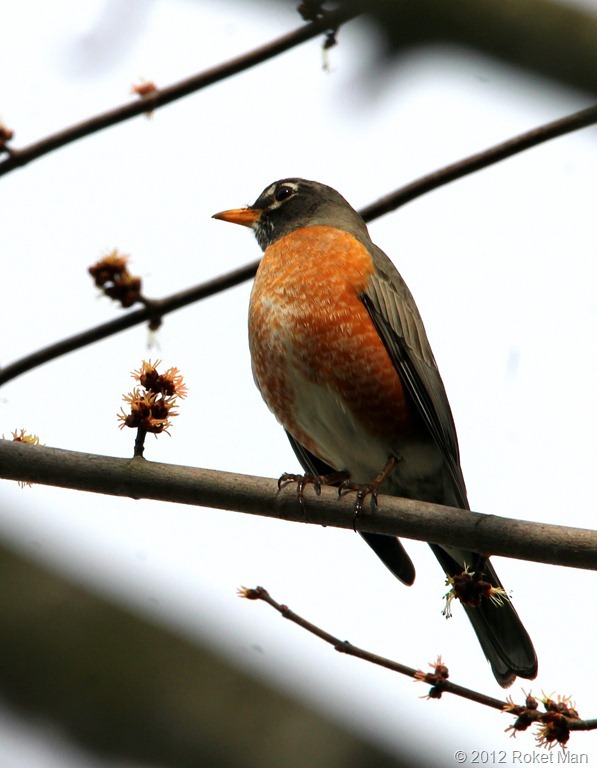 I’ll have to show my mom this blog because she loves robins. So you are seeing them already there..hmm I think I will have to start watching for them here too. I have seen many geese in flocks headed north though..maybe you are right a sign of good things to come. Yep, I’m biblogual. When Live Spaces started spiraling down the tubes I was already fed up with their “improvements” and was looking for a new blogging adventure. I couln’t decide which I prefered so I gave Word Press and Blogger a try simultaneously. I still can’t decide so i write on bothe. usually different posts for each but sometimes the sam on both, when I’m feeling creatlively challenged. Great photos! 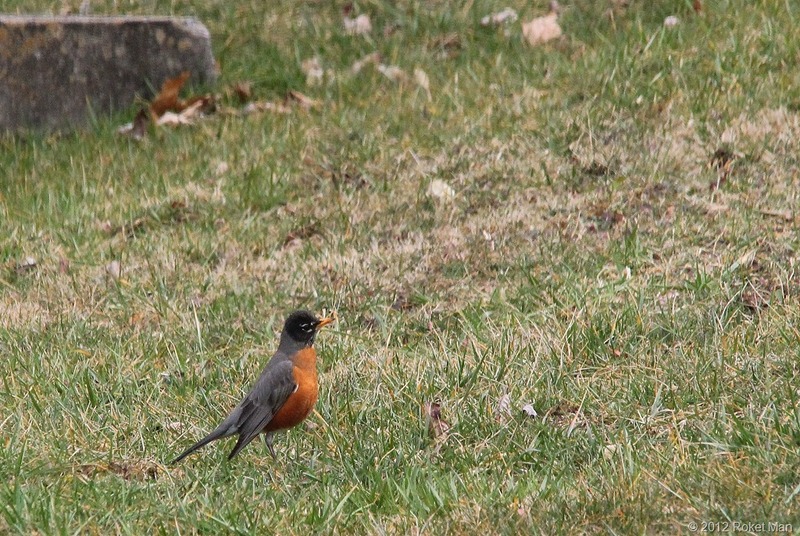 Robins are such good posers since they run a little stop, run a little, stop. Haha. I really enjoy the fledglings in late Spring with all their great feather colors. I hope you end up with better weather coming! 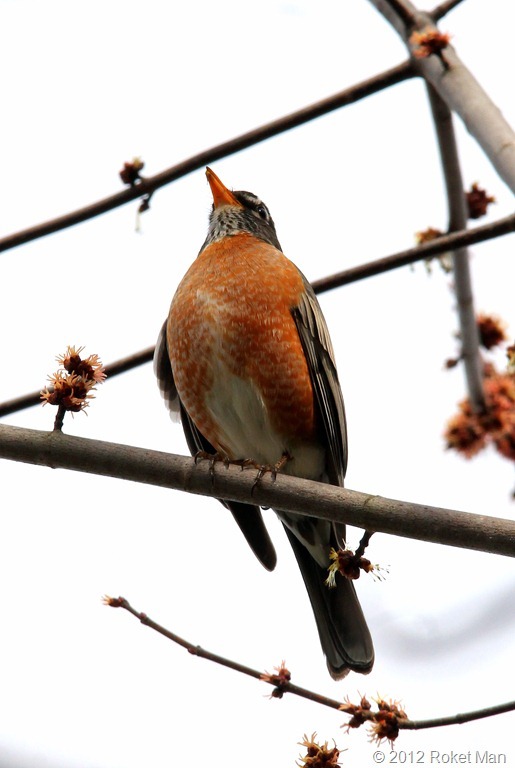 I’ve been seeing Robins up here in Rockbridge County in Jan. Thought that was weird. But we have had weird weather anyway. So here is a question Chip, what bird sounds like it says “pretty girl?” My mom keeps pestering me, and everyone else with that. Says there is some bird that she can’t figure out which one, but it has a call that sounds like pretty girl. 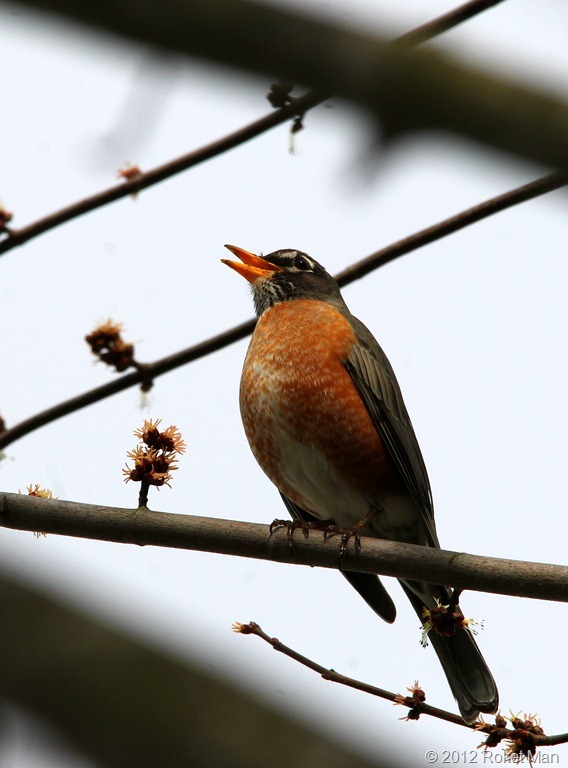 One good thing about March is the birds are active in the mornings with song. Great shots … I can almost hear them calling! I hope the snow failed to arrive …. 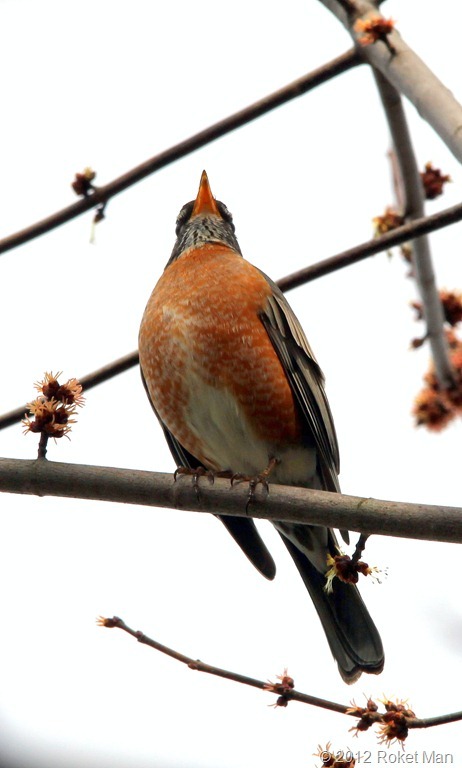 Lovely birds and amazing photos, Chip. City boy now retired and loving life in The New River Valley area of Southwest Virginia. I'm a US Air Force vet who served on a 4 man Titan II ICBM (Intercontinental Ballistic Missile) Missile Combat Crew for nearly 4 years in the early 70s. Yes, I was one of those men in the silos standing ready to launch a nuclear strike on the Soviet Union. Thank God the execution message never came. After 5 years in the Regular Air Force I transferred into the Ready reserve and cross trained as a Pararescueman serving for another 9 years in the Special Operations Community. Please Note: All of the text and photos on this site are the property of Chip "Roket Man" Allen and are protected by US Copyright Law. You are NOT permitted to copy, transmit, or store any of these photographs without prior written permission.